The Keuffel & Esser Building, 127 Fulton St., was designed by the well known architects De Lemos & Cordes and constructed 1892-1893 (AIA Guide to New York City, 5th ed., 2010). A Landmarks Preservation Commission Report (2005) for the building is available on the internet at www.nyc.gov. A Streetscapes article by Christopher Gray (New York Times, 12 Jan. 2003) includes, "In the same period [1889 to 1895] DeLemos & Cordes designed a building that still entrances passers-by, the old eight-story Keuffel & Esser headquarters at 127 Fulton Street. Established in 1867 by Wilhelm Keuffel and Herman Esser, the company was prominent at the turn of the 20th century for drafting and surveying instruments -- hence the calipers, triangle, pliers and other tools in the cast iron storefront. Keuffel & Esser, which also became known for its slide rules, was absorbed into the Azon Corporation in 1987." Founded in 1867, Keuffel & Esser were manufacturers of drafting, drawing, surveying, and other scientific instruments and equipment. Originally in New York, they moved to Hoboken, New Jersey, in 1875. Manufacturing was done in Hoboken from 1875 to 1967/68. The building above served as offices and a retail outlet. Founders were Wilhelm Johann Diedrich Keuffel (1838-1908) and Herman Esser (1845-1908). 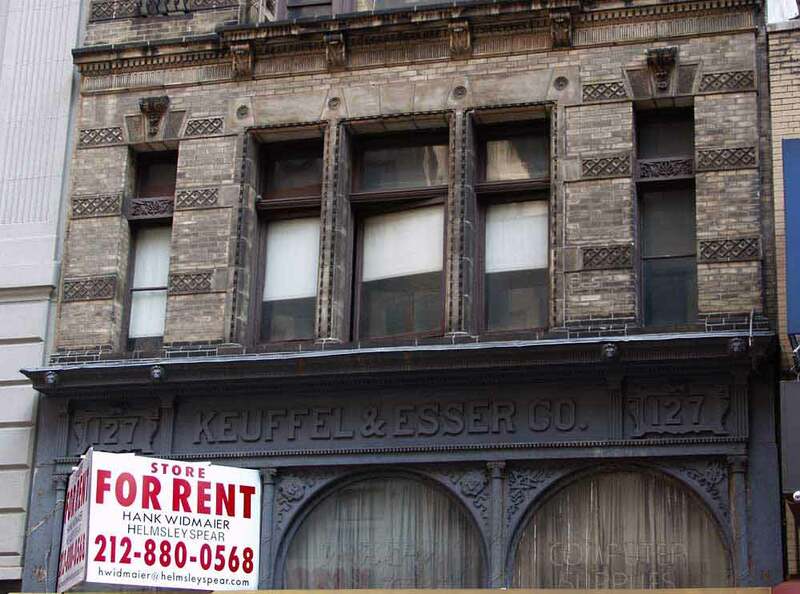 The website jerseyhistory.org includes the following on Keuffel & Esser, "Wilhelm Johann Diedrich Keuffel and Herman Esser were partners in the firm of Keuffel & Esser which was founded in July 1867 at 79 Nassau St. Manhattan. They were two German immigrants, who were importers and jobbers of drawing materials and mathematical and surveying instruments. Keuffel (1838-1908), born in Walbeck, Germany and was employed in the hardware business in Germany and Birmingham, England, prior to his immigration to Hoboken, NJ, in 1866. The next year he joined with Herman Esser (1845-1908) who was originally from Wuppertal-Elbertfeld. In 1875, the firm was incorporated as Keuffel & Esser Company (also known as K & E) and moved from Manhattan to Third and Grand Street in Hoboken, New Jersey. Wilhelm J. D. Keuffel died in Hoboken, New Jersey in 1908. Herman Esser retired from Keuffel & Esser Co. in 1902. He was back in Bad Godesberg am Rheim, Germany in April of 1902 and died there in April 1908. The company continued to prosper under new leadership. In the coming decades, Keuffel & Esser began to expand, opening showrooms, offices and new factories in New York, New Jersey, Chicago, St. Louis, San Francisco, Detroit, and Montreal. They first manufactured surveying instruments in 1885 and introduced an innovative new line of surveying equipment in the 1890s. The company's first product was hard rubber curves and triangles. Later products included drafting paper, surveying instruments, and drafting aids such as slide rules. Keuffel & Esser held patents for a wide range of slide rule features, including improved cursor indicators, functions and scales, and the adjustable body mechanism. The company was so successful that in 1965 it went public on NASDAQ. However, in the coming years, rapid changes in technology including the development of calculators, CAD systems and laser surveying systems, had a detrimental effect on Keuffel & Esser, which shrank drastically after 1972. In 1982 Keuffel & Esser filed for Chapter 11 bankruptcy and eventually was bought out by several companies including Azon Corporation. Currently, Azon Corporation owns the Keuffel & Esser name and trademarks." The website Hoboken Historical Museum includes, "A manufacturer of drafting, surveying, architectural and engineering tools (including the slide rule, a device that they introduced to America) that established itself in Hoboken in 1875. While founded in New York City in 1867 and where it maintained a 'Parent Office', by 1880 it began to build what became a complex of buildings for general offices and factories in Hoboken on the north side of Third Street running from Clinton to Adams Streets including the one with a four-sided clock tower in 1907. Company is often referred to as 'K&E'. They issued circa 45 editions of their catalog which are the major resource for identifying their production. Many items are marked as 'Keuffel & Esser, N.Y.' or 'K&E, N.Y.' They were actually made or assembled in Hoboken. Some products also have the Hoboken name and/or address on them plus on some printed labels and in catalogs, the artist's bird's-eye view of the Hoboken buildings which was captioned 'General Office and Factories in Hoboken, N.J.' Not all items were made in Hoboken; some products or parts were imported from Britain, Switzerland and Germany et al (and were marked with the country of origin), but Hoboken served as the point for packaging and distribution. The range of catalogue products was extensive, but they also produced a large number of items that did not appear in their catalogues, such as scientific apparatus, machine tools, government and military orders, etc. It should be noted that dating items and serial numbers related to the their lines is problematic. The company is no longer in business, although its trademarks are owned by another corporation. The company left Hoboken circa 1967-68 for a new center of operations in Morristown, New Jersey. The building with the clock tower was converted to residential housing in the 1970's, one of the earliest examples of the adaptive re-use of industrial buildings for living. The apartment house is now commonly called The Clock Tower Building." An obituary of Wilhelm Keuffel appeared in The American Stationer, 10 October 1908, reading, "Wilhelm J. D. Keuffel, of the firm of Keuffel & Esser, manufacturers of scientific instruments, died at his home in Hoboken, N. J. last week. Mr. Keuffel was born in Germany seventy years ago. He came to this country a poor man and in 1867 he established a partnership with Herman Esser as Keuffel & Esser and started a small factory on Nassau street in New York. In 1871 the business was moved to Hoboken, where it is still conducted under the same firm name. Mr. Keuffel was a pioneer in the business of manufacturing delicate instruments for mathematical calculation and drawing and the factory is now the largest of its kind in the world. He was attacked by a stroke of paralysis last spring and had been in a precarious condition since. Mr. Esser died over a year ago and his partner was much affected by the loss. Mr. Keuffel was a member of the Board of Trustees of the Hoboken Manual Training School, of the German Club since 1869, the Board of Trade, the Stationers' Board of Trade of New York and the Technical Society of New York. He is survived by a wife and four children. A son, William G., is vice-president of the Keuffel & Esser Company. Mrs. Busch, a daughter, lives in Russia. Another daughter is Mrs. B. M. Bergenau of Hoboken." The National Cyclopaedia of American Biography, 1920, includes the following on Keuffel's early life, "Keuffel, Wilhelm Johann Diedrich, manufacturer, was born in Walbeck, Germany, July 19, 1838, son of Gottfried C. A. and Auguste (Walter) Keuffel. He was educated in the public and private schools of his native town. At the age of fifteen he left school and became an apprentice in a general merchandise store, where he remained for four years, and received a thorough mercantile and business training which fitted him for his later successful career. He then entered the employ of a large hardware house in Hanover, Germany. Several years later he went to Birmingham, England, and in 1866 came to the United States, settling in Hoboken, N. J., where in the following year, in association with Herman Esser, he founded the firm of Keuffel & Esser." This obituary of Herman Esser appeared in American Machinist, 30 April 1908: "Herman Esser, formerly of the Keuffel & Esser Company, died at Godesberg on the Rhine, Germany, on April 16, at the age of 62. Mr. Esser was born in Dueren, Germany, and emigrated to this country when a young man, where he formed a partnership with Mr. Keuffel in 1867 under the firm name of Keuffel & Esser, for the sale of drafting instruments and other things of a similar nature. Later they took up the manufacture of these instruments and the firm finally grew into a stock company for the manufacture and sale of drawing materials and surveying instruments. Mr. Esser was vice-president and treasurer of the company until 1902, when he retired from active business and moved his family to Godesberg on the Rhine, to enjoy the fruits of his labors. He was a member of the Hardware Club. Some patents were held by Mr. Esser for improvements made in some of the instruments which were manufactured by the company and the business was built up to its present size from a very small beginning by the active labors and business management of himself and partner during the 35 years that he was connected with it. Mr. Esser had an attack of pneumonia and went to the southern part of Germany to obtain relief. Thinking he was recovered, he returned to his home apparently as well as ever but the disease again showed itself and in less than five days he passed away." The website http://www.immigrantentrepreneurship.org has a great deal of detail on Wilhelm Keuffel and on Keuffel & Esser. The article begins, "Wilhelm Johann Diedrich Keuffel was one of the founding partners of Keuffel & Esser Company (K&E), a scientific instrument manufacturing firm founded in New York City in 1867. Best known for its popularization of the slide rule, Keuffel & Esser was the first American company to specialize in the manufacture and sale of drafting and surveying tools. By the early twentieth century, it was one of the largest manufacturers of scientific instruments in the world." K & E Co on this pediment on Grand St., Hoboken, New Jersey, marks the location of Keuffel & Esser's manufacturing plant in Hoboken. Daytonian in Manhattan includes several nice images of the Keuffel & Esser building on Fulton Street, including one of the 1878 predecessor to the current building. The Biggert Collection of Architectural Vignettes at Columbia University contains a Keuffel & Esser letter dated 28 October 1891. The letterhead shows the factories in Hoboken, N. J. This ad from The Architectural League of New York's Illustrated Catalog of the Twelfth Annual Exhibition, 1897, shows a fuzzy image of 127 Fulton St., but mentions K & E locations in Chicago and St. Louis. This ad from 1913 illustrates a Keuffel & Esser slide rule. This ad from 1916 lists Keuffel & Esser services like blue prints and tracing. An 1892 Keuffel & Esser catalog can be access on the website babel.hathitrust.org. A great many other Keuffel & Essor catalogs are available at http://www.mccoys-kecatalogs.com/. Keuffel & Esser published a monthly journal called The Compass. Issues for the years 1891-1892 are available on google books. New York Public Library holdings run from 1891 to 1894.